Comments Off on Why Do Carpet Stains Resurface After Carpet Cleaning? Many people have heard the stories about spending money on professional carpet cleaners only to see some of the stains start popping back up over the next few days. 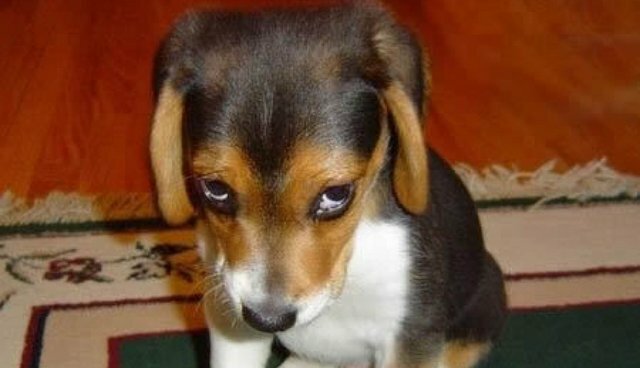 Unfortunately, a stain resurfacing is a real possibility and is especially common in the case of pet stains. In this post Discover Carpet Care will explain exactly why stains resurface and what kind of carpet stains are most likely to resurface. Water can travel up a small tube or fiber, such as a carpet fiber, on its own through a process called capillary action. The simplest way to demonstrate this is the old elementary school celery in red water experiment. 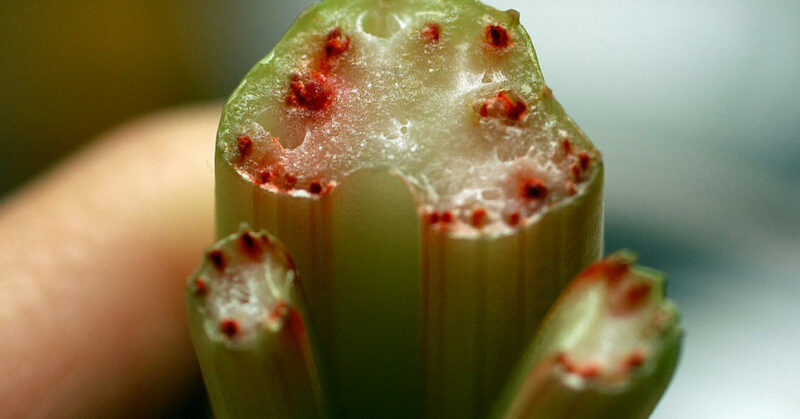 Celery has a bunch of little tubes inside that allow water to move from the bottom of the plant to the top of the plant. If you leave celery in water with red food coloring you can see the dye start traveling up through the little tubes and up to the top. 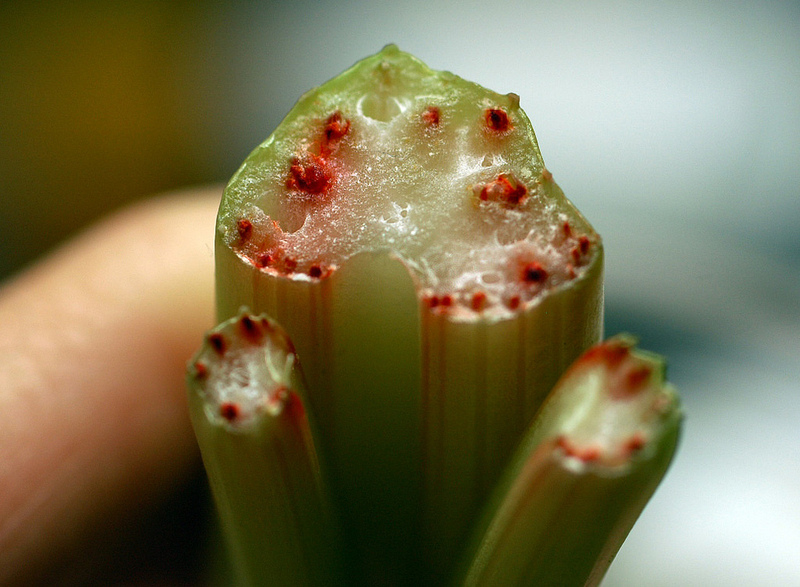 The picture to the left is an example of celery that has been sitting in water with red food coloring overnight and you can clearly see that red food coloring has moved up the tubes. This is capillary action at work. Water is able to do this because of its unique chemical structure that causes a chemical property known as cohesion. The simplest way to understand cohesion is to think of water as being sticky and attracted to other water molecules. Since water is attracted to other water this means if one water molecule moves into a fiber/tube the others will follow it and therefore push the water molecule further up the tube/fiber. OK But What Does This Have To Do With Carpet Cleaners? When you have your carpets steam cleaned a small amount of moisture will be left trapped in the padding underneath the carpet for a while after the cleaning was performed. This means that if the padding is dirty the stains trapped in the padding can work their way up to the surface of the carpet via capillary action. This process is known as wicking and it is just like how the red dye moves to the top of celery in the red food coloring experiment. 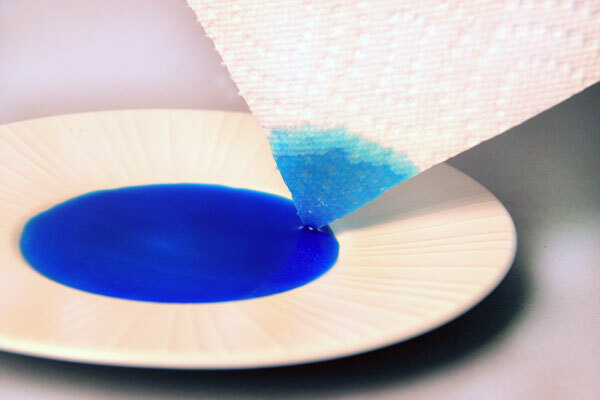 Wicking is a form of capillary action and a simple way to see this process at work is to take the corner of a paper towel and place it into some water with food coloring. The water will travel up the paper towel’s fibers just like how the stain in the damp carpet padding will travel up the carpet fibers back to the surface of your carpet. Its also important to remember that you will be walking on the carpet and therefore compressing the padding underneath. Just like a sponge the carpet padding will release moisture when compressed and this will increase the amount of wicking that is taking place. Walking on areas where stains were removed shortly after carpet cleaning will increase the likelihood of a stain resurfacing from the padding. What Carpet Stains Are Most Likely To Resurface? The types of stains that are most likely to resurface are the ones that were caused by a liquid because they are the ones most likely to have become trapped in the padding underneath the carpet. This means that carpet stains caused by drinks, mud, or pet accidents are by far the most likely to resurface. However, this doesn’t mean that other stains can’t resurface. Any stain that has worked its way into the carpet padding can resurface after cleaning. 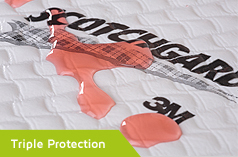 If our technicians think a stain is likely to resurface they may recommend an examination of the padding and a sub-floor treatment to treat for stains that are trapped in the padding. In the worst cases we will recommend replacing the carpet padding before cleaning to guarantee that the stain will not resurface. Replacing the padding is much cheaper that replacing the carpet and can significantly increase the lifespan of the carpet. Changing the padding will also improve the results you get when you hire carpet cleaners. The best way to prevent stains from resurfacing after carpet cleaning is to invest in high quality carpet padding. All padding is not created equal and spending a few extra cents per square foot on the padding can significantly increase the lifespan of the carpet on top. There are a few different types of carpet padding available and the most basic will be shredded foam. If you’re going to go with the cheaper shredded foam carpet padding always make sure to get the ones that have a moisture barrier added on top to help prevent spills from working their way into the padding. The gold standard for carpet padding is thick solid foam padding with a moisture barrier such as Scotchgard foam padding or memory foam with Dupont Teflon surface protector. These two types of padding are very comfortable to walk on, have strong water barriers on top to prevent spills from getting into the padding, and are designed to be resistance to mold/mildew/bacteria. So the next time you go shopping for new carpet make sure to pay just as much attention to the padding you’re putting underneath the carpet as the color and feel of the carpet itself.